viaLibri ~ Manuscript Brewer's Journal of Bedford Brewery Newland & Nash, with Detailed Beer Making Methodology. 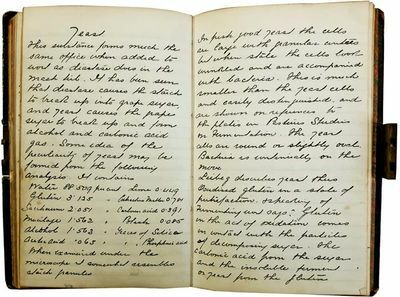 Manuscript Brewer's Journal of Bedford Brewery Newland & Nash, with Detailed Beer Making Methodology. Bedford, 1875-1898., 1875. Manuscript brewer's journal of Claude Edmund Clark, Managing Director of the Bedford brewery Newland & Nash, containing detailed notes on systems and processes for making beer, with calculations, recipes, as well as discoveries and inventions by leading scientists of the period including Louis Pasteur, Dr. Charles Graham, Justus Freiherr von Liebig, and brewing expert William Littell Tizard, featuring one manuscript drawing and pertinent contemporary newspaper clippings mounted within. Ownership inscription on fly leaf dated January 1875. 8vo. 192 pages. Black calf boards, brass clasp without key, marbled edges, marbled endpapers. Wear to binding, a scant few leaves excised, otherwise in very good condition, fascinating early methodology for brewing beer and making liquor. The author of the present volume went to great lengths to ensure quality beer was produced. This is evidenced in his travels within and beyond the county of Bedfordshire, to observe specific methods of other brewers, and with his frequent references to the works of Louis Pasteur, Dr. Charles Graham, Justus Freiherr von Liebig, and brewing expert William Littell Tizard. Claude Edmund Clark Esq., remembered mainly for his work with the Newland & Nash brewery in Bedford, was brewing from at least January 1875, according to the early entries in the present volume. He was listed as a brewer, resident of St Johns, Bedford, when on 10 June 1886 he married Anne Elizabeth Whitworth of Kempston. On 7 August 1887 they had a daughter whom they named Violet Adaline. On 29 May 1893 they gave birth to a son, Claude Stanley Clark, who would also become a brewer. His father, William Chignell Clark, was a schoolmaster. Newland & Nash began as a malthouse in 1783, expanded rapidly for several decades, and became a public limited company in 1897. Clark was secretary Debenture Trustee of the Limited Company by 1898, and possibly in 1897 immediately upon incorporating. He held this title until 8 Jun 1937, and by 1940 he was listed as the Director of the brewery according to records held in the Bedfordshire Archives. . Manuscript.